Hello! 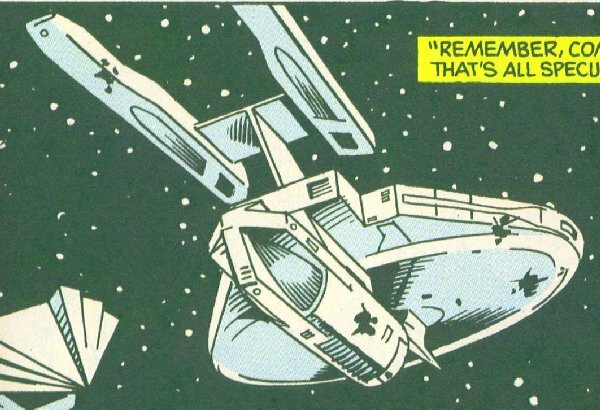 Does anyone have any pictures or drawings of the USS Marco Polo NCC-7219 and the USS Caspian NCC-5507 from the DC comic book "Thin Ice" TNG Vol.2 or know where I can find some. The Caspian should be much like USS Troy at the lower part of the page. Also, I know the name USS Trial is canon, but is the registry and/or class? More than likely Trial was the Miranda that we saw. Timo- ya wanna color these? That would rock. Besides, I didn't do the page I linked to. It even says "Topher" in the link. But I love to color starships. Now where did I put my whitish-bluish crayon box...? A lot of those Starfleet designs on both pages make my colon itchy. Also, the one that Jason posted has some serious "WTF, MATE?!?" scaling issues. No- that's the official FASA scales at work- I guess the notion was that the standard nacelle from a connie refit could be scaled down to accomidate smaller starships Just as they did in TNG). Takes some getting used to though. The stuff at the far right is NOT supposed to be in scle with the starships- the upper right are the huge Spacedock structures and the bottom right are the small cutters and monoitor craft. Some of the FASA designs make 0.82 ounces of sense if you scale them by the cut/paste saucers and nacelles. Some make sense if you assume two scales for each item, 100% and 50%, and pretend that the 50% solutions look slightly different. Some just don't. And the Marco Polo is pretty enough to look at. In which context in the comic is she defined to be a Challenger class vessel? Is there any wiggle room? Nope. At one point Troi is looking up the bio of the Marco Polo's CO. It quite clearly states on the computer screen that she's a Challenger-class starship. Here's the Challenger. This pic is from Bernd's site, although the URL says "trekships.org." Don't have any pics of the Caspian, though (I don't have the comic, either, or I'd make 'caps). Meh. Find a Larson-class destroyer, swap the nacelle and saucer for a movie-era equivalent, and off you go.